Friend and former colleague Jared Bernstein made a defense of the ACA excise tax on expensive employer-provided health insurance plans a couple of days ago. It’s about as good a defense as there is of the excise tax, but at EPI we’re still largely unconvinced. He provides some arguments on the substance of the tax (which I’ll briefly touch on below), but mostly leans on a political argument, that this is a tax that actually exists, and given the anti-tax zealotry of congressional Republicans, we should be very leery of giving away any revenue that is currently on the books. First, some economics, and then on to some politics. Jared and I are roughly on the same page regarding the wage/health care trade off issue. As the excise tax is imposed on plan costs above a certain threshold, this will encourage people to shift into plans with lower upfront premiums. But these lower upfront premiums mean that more health costs are shifted onto households in the form of higher co-pays, deductibles, and co-insurance. The good news of lower premiums, however, is that this frees up money for employers to give more compensation to workers in the form of cash wages rather than health premiums. Elise Gould and I have argued in the past that this wage boost stemming from less-generous health plans is likely to be a long time coming, particularly if labor markets remain slack. Jared agrees. He argues this trade off likely will happen in the longer run. I agree (though I’m not 100 percent sure, and am troubled by the lack of robust empirical support in the research literature on this). My beef has mostly been with people who simply state that the excise tax will lead to a “raise” for American workers. That’s bunk. It will change the composition, not the level, of employee compensation. And it will increase total taxes on this compensation, hence cutting their take-home pay. We have argued that the real problem with the tax is that the increased cost shifting will indeed cause people to cut back on health care spending, but because the American health system is opaque and uncompetitive, there will be no good information to tell consumers what they should cut back on first. So, they will cut back across the board, making decisions that are bad for health and do nothing to boost dollar-for-value in health spending. Recent research provides further confirmation of the destructive impact of the sort of scattershot cost shifting that the excise tax will result in. Jared thinks we overstate this, and references the fact that in the beginning years of the tax, few plans (and fewer health care dollars) will be affected. But the tax is designed to grow over time, and you can’t really claim that this is a vital revenue raiser and then claim that it won’t affect many people or many health care dollars. If it’s not impacting anybody, it is by definition not raising any revenue either. Further, if the claim is that the tax really won’t do much at all to change people’s behavior in consuming health care and hence our concern is exaggerated, then Jared is in a sense conceding our point on the lack of any inherent policy virtue of the tax. That is, if it does not result in people cutting back on health spending, all it’s doing is raising revenue, and we can then choose an equivalent revenue raiser with fewer problems (which would bring us to his political objections, which I wrestle with below). Jared references some recent arguments made by excise tax proponents that its imposition will actually not lead to thinner plans with higher co-pays, deductibles, and co-insurance. The argument runs that firms and workers will begin pressuring health insurance providers to find efficiencies in insurance and health care provision and obtain lower-cost care of equivalent quality through these efficiencies. This really strikes me as magical thinking. If such efficiencies exist today, why aren’t firms and workers demanding them? Yes, the excise tax provides a tiny bit larger incentive to demand these, but an awfully big incentive is sitting out there today. A quick example—I pay about $10,000 each year directly for family health insurance premiums through my employer-provided plan. Does anybody really think I wouldn’t really, really like to pay less than this? Or does anybody think EPI (my employer) wouldn’t love to lower what it pays in its contribution to health care premiums for employees? What is lacking here is not will or incentive on the part of workers and firms, it’s a mechanism that links employees’ and firms’ desire for cheaper, more efficient health care to insurers’ and providers’ ability or motivation to provide it. The excise tax doesn’t change any of this. In the end, the meat of Jared’s argument is political—we have a tax on the books today, Congress is deadlocked by anti-tax zealots today, so we should not give away this precious revenue. It’s a good argument. We will eventually almost surely need more revenue to maintain projected spending levels on valuable social insurance programs (including the ACA, but also Social Security, Medicare and Medicaid), public investment, and generally functional government. But I do think two recent economic developments make the need for revenue less pressing in the near-term. First, health care cost-growth has decelerated significantly over the last decade, with the slowdown preceding the Great Recession. This makes the need for more revenue in the medium-term much less pressing. 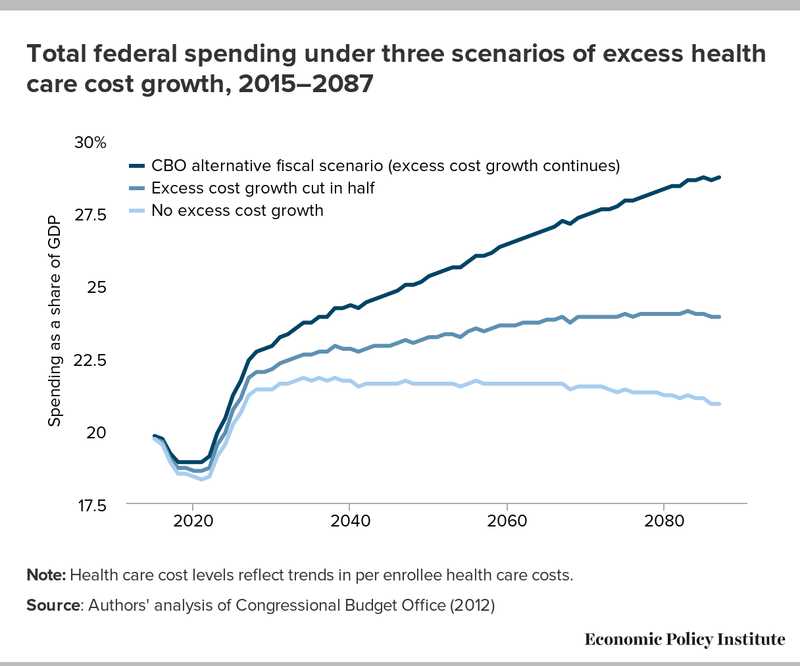 The projected future budget deficits that are so often breathlessly reported by DC policy types are driven entirely by rising health care costs. As these costs have risen more slowly recently, the size of projected future budget deficits has declined as well. Can we bank on tame health care cost growth forever? No, but it does buy us time. Second, when discussing macroeconomics, many of us (Jared included, I believe), take seriously the worry that we’ve entered an era where advanced economies may have chronic shortfalls of aggregate demand for years to come. Basically, a range of factors (rising inequality, a global savings glut, the declining cost of capital goods, who knows what else) seem to have conspired to keep households, businesses, and governments from spending enough to keep the labor force fully employed. In the jargon, this is sometimes referred to as secular stagnation. A key policy conclusion from this is that we can and should run larger government deficits than would’ve been considered desirable in earlier eras. These deficits spur demand, and the traditional downside of deficits run during times when the economy is near full-employment (high and rising interest rates) do not materialize. Again, will the age of secular stagnation be with us forever? Probably not, but this again buys time against when we will need more revenue. And this time is crucially important. Surely we can’t make all possible policy decisions today based on the premise that we’ll never have a reasonable Congress again. This would argue for striking a deal, any deal, that preserved any piece of currently scheduled Social Security benefits because under current law more revenue will be needed to keep these benefits from falling significantly 20-something years from now. I do wish we weren’t debating whether or not to give back some revenue legislated as part of the ACA. But I also wish we had adopted a better revenue source back then. And, in some sense the good-faith debate over a laser-focused change in the excise tax is a healthy normalization of health policy debates. Nobody—not even fervent proponents like us—thought that the 2010 passage of the ACA solved all U.S. health care problems forevermore. The ACA and Medicare and private insurance will need to be tweaked and adapted in coming years. For the past six years, the health care debate has been entirely hijacked by anti-ACA obsessives in Congress. Having a substantive policy debate driven by people who like the ACA writ large but want a minor course adjustment should be seen as a return to policy normality.